Missoni will launch an eponymous fragrance for women later this month. It is the brand's first perfume since 2008, and the first under new licensing arrangements with Euroitalia. Missoni by Missoni is fronted by Elisa Sednaoui. Missoni was developed by perfumer Quentin Bisch. Notes for the woody fruity floral include lemon, bergamot, citron, pear, mahonial ("lasting floral character and slight jasmine undertones"), petalia, jasmine, tonka beans, sandalwood and ambroxan. 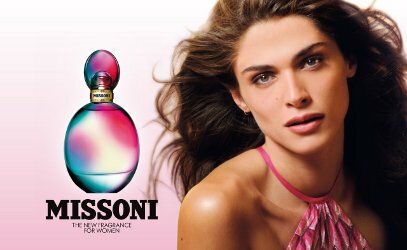 Missoni by Missoni will be available in 30, 50 and 100 ml Eau de Parfum. Oh! It’s been a while for them. I actually liked the chocolatey one they had, and my mom LOVED the aqua one they released after it. Too bad they didn’t make it. I’ll definitely try this new one if it comes to the U.S. If! Haha! Those were under Estee Lauder, and I don’t think they did that well. This one is definitely coming here! Does this mean that the older ones are discontinued? Adding…they did not do well to begin with, so would be weird if Euroitalia decided to keep making them. But the WWD article does not say. I have not seen any of them in stores for eons.